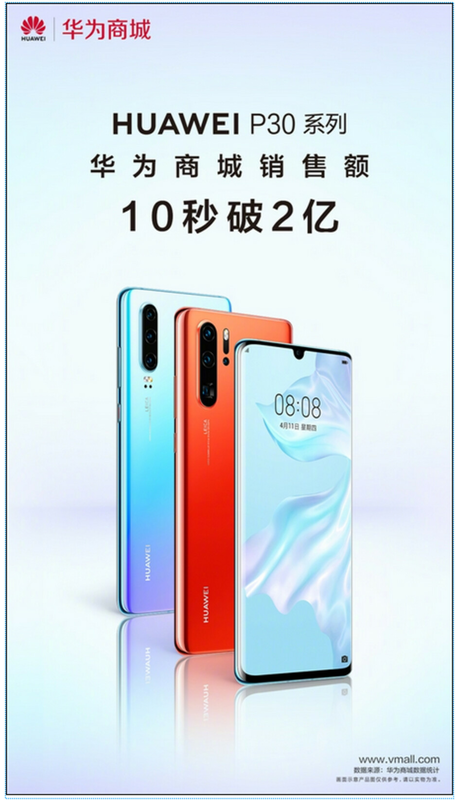 The Huawei P30 is priced at 3,988 Yuan ($595 USD) for the model with 8GB of memory and 64GB of storage. Doubling the storage to 128GB takes the price up to 4,288 Yuan ($640 USD). The model with 256GB of storage goes for 4,788 Yuan ($714 USD). The P30 Pro has a price range between 5,488 Yuan and 6,788 Yuan ($818 to $1013 USD). The first 3,000 who pre-paid for their phone will receive a free selfie-stick. In a flash sale, a manufacturer puts a limited number of phones up for sale (or pre-order, as in this case). Consumers pre-register and when the date and time of the sale arrives, they start typing away to lock up the phone they want. So when you hear that Huawei sold out the P30 and P30 Pro, it doesn't mean that the complete production run was sold out. It merely means that the number of units put up at today's flash sale is all sold. The Huawei P30 features a 6.1-inch AMOLED display with a resolution of 1080 x 2340 and an aspect ratio of 19.5:9. Under the hood, you'll find Huawei's home grown Kirin 980 SoC. 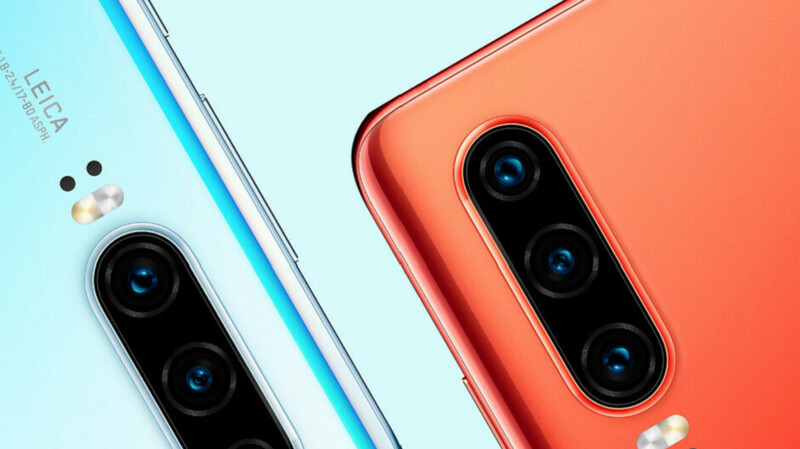 The triple camera setup on back includes a 40MP primary camera, a 16MP camera with an ultra-wide lens, and an 8MP camera with 3x optical zoom. There is a 32MP front-facing selfie snapper, and keeping the lights on is a 3650mAh battery. Will the P30 line help Huawei overtake Samsung and Apple this year? The Huawei P30 Pro is equipped with a 6.5-inch AMOLED display carrying a 1080 x 2340 resolution and an aspect ratio of 19.5:9. Also powered by the Kirin 980 chipset, there are various configurations including 8GB of memory with 128GB, 256GB or 512GB of storage. The quad-camera setup on back sports a 40MP primary camera, a 16MP camera with an ultra-wide lens, and an 8MP camera with 5x optical zoom. There is also a 5MP Time-of-Flight sensor. This measures the speed it takes for an infrared light to bounce off a subject and return to the camera. It is used for 3D mapping, the blurred bokeh effect and certain AR effects. There is a 32MP selfie snapper included, and the included 4200mAh battery can be rapidly replenished using a 40W charger. The latter will take a battery from 0% to 70% in 30 minutes. Last year, Huawei shipped over 200 million handsets for the first time and finished third globally behind Samsung and Apple. This year, the company is aiming to replace Samsung at the top, although it might have to wait until 2020 to accomplish this. Of course, Huawei does not have a partnership with any of the major U.S. carriers. That's because the U.S. government considers the firm to be a threat to national security. The communist Chinese government has a law that requires tech firms like Huawei to gather intelligence for it whenever they are directed to do so. As a result, there has always been a fear among lawmakers that Huawei phones and networking equipment contain a back door that can be turned on at any second; this would be used to gather information on U.S. consumers and corporations and send the data to Beijing. Huawei had denied this a number of times. Huawei is not only the third largest smartphone manufacturer in the world, but it also ranks as the top provider of networking gear globally. The vast majority of Samsung phones sold are low budget models not flagship models, same goes for most OEM's. Phone makers cover most markets, shock horror! The vast majority of people don't want or need a phone costing $1000+. So what's the point you are trying to make? How many units did they sell? And i keep being told high end phones are not selling. Pre-order for both phones had begun and ended here in Thailand for over two weeks ago and now you can even go to the store and purchase it without any reservations. How does something sell out in 10 seconds? It takes more time to add something to your cart and get to the checkout page. Were these all purchased via bots by resellers ordering large amounts? Some countries have free gift like Bluetooth speaker and cases if you pre order. That's how competitive it is right now in the mobile phone market.